Protection in style. Whether you are traveling or storing your timepieces and valuables. This Wolf Design leather case is perfect for any occasion. It is a hard leather outer case with just the right amount of padding in the interior offering maximum shock protection. 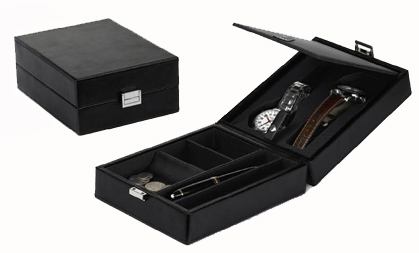 There is also a protective interior layer which further protects your watches from whatever you may have placed in the storage portion of the case. It closes with a stainless steel clasp which adds to the elegance of the case.